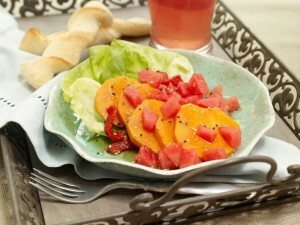 FEATURED RECIPE: WATERMELON-GLAZED SWEET POTATOES - What About Watermelon? I know I’m not the only one who tries not to overstuff myself at holiday get-togethers but inevitably does. I just can’t help myself. By the time that I get all that tasty, gravy-smothered goodness on one plate, I’m already thinking about what I’ll feast on the second time around, and I just can’t say no when my Great Aunt Joyce offers a slice of pie or two…or three. Eating healthy during the holiday season IS possible, and I’m going to prove it to you with this recipe for Watermelon Glazed Sweet Potatoes. With a boost of flavor, this recipe doesn’t skimp on the nutritional value; the orange-fleshed sweet potatoes are loaded with vitamin A and fiber while the watermelon provides lycopene, which is essential for healthy skin. Heat oven to 375 degrees. Spray a low-flat baking dish (11” x 8” is fine) with cooking spray. Set aside. Bring watermelon juice to a gentle boil in a medium saucepan over medium heat until liquid is reduced to ½ cup. Remove from heat. Add butter and sugar and stir until melted and thoroughly blended. Add rum extract and salt and pepper to taste. Wash and scrub sweet potatoes. Peel if desired, although not necessary. Cut into large fries, approximately 4” x 1”. Toss with watermelon glaze and pour into the baking dish. Bake for approximately 35 minutes or until softened, but still firm. Toss with glaze several times during the baking process. Remove from the oven. Toss again to coat potatoes with remaining glaze.